1 Trim the aubergine and cut into small pieces. Layer in a colander or large sieve, sprinkling with salt. Set aside to drain for 30 minutes, then rinse well in cold water and pat dry. 2 Meanwhile, bring a large saucepan of water to the boil and cook the pasta according to the packet’s instructions. Drain well and set aside. 3 While the pasta is cooking, heat the oil in a large saucepan and gently fry the onion and pepper for 5 minutes until just softened. Add the aubergine and courgette, and cook, stirring, for a further 5 minutes. Add the chopped tomatoes, herbs, ham and black pepper and stir. Bring to the boil, then reduce the heat, cover and leave to simmer for 15 minutes until the vegetables are tender. 4 Preheat the grill to hot. Stir the pasta and 110g (4oz) of the mozzarella into the vegetables. Pile into a large shallow ovenproof dish and sprinkle with the remaining mozzarella and the Parmesan cheese. Place under the grill and cook for 4–5 minutes until the cheese has melted and is bubbling. Serve immediately or cool and freeze, as described opposite. To freeze, allow to cool. Transfer to individual freezer containers. Freeze for up to 6 months. Allow to defrost overnight in the fridge. Reheat in the oven in a small ovenproof dish, covered with foil, until piping hot. 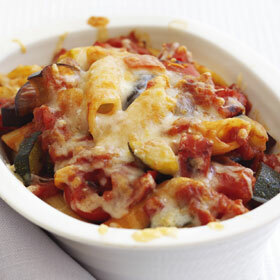 For a quick version, replace the vegetables and chopped tomatoes with 4 x 390g cans ratatouille. Recipe taken from Clever Cooking for One or Two, Dairy Cookbook. Thanks so much Isabella, that’s lovely to hear. I have had the Dairy Diary sincve 1982 and even though I now live in Australia I would not be without it. I have had the Dairy Diary since 1982 and even now living in Australia I would not be without it. Have just ordered the 2011 edition. Just love evrything about it.